It’s easy to understand why parents need life insurance. If a family’s main wage earner were to pass away, their surviving spouse and/or children would likely need financial support to help cover things like living expenses, mortgage payments, and college education. Almost everyone agrees on that fact. According to LIMRA and Life Happens’ 2018 life insurance study, 90% of consumers think a family’s primary wage earner needs to own life insurance. But what about families with two substantial sources of income? Older parents who’ve paid off their homes? Younger couples without any children? Who else needs life insurance? Parents with children have arguably the most pressing need for life insurance. As parents doubtless already know, kids are expensive. The USDA’s most recent report puts the average cost of raising a child at more than $230,000 — and that’s before college expenses. Factor in the average amount paid for a four-year degree at a public institution ($77,000) and, well, things start to add up. Life insurance can help with any number of financial needs in the event that a parent passes away. The death benefit is generally handed down as a lump sum payment, so it can be put toward whatever expense the family finds most urgent: daily living expenses, daycare fees for younger children, funding college savings like a 529 plan, adding car insurance for teens, paying family cell phone bills, and so on. For a more accurate estimate of what it’ll cost to raise your children, check out the USDA’s cost of raising a child calculator. It factors in the number of children you have and their ages, your household’s income level, and the region you live in to pin down how much you’ll likely spend over the first 18 years of parenthood. It might also be worth using an online life insurance calculator to see how the cost of raising a kid translates to your life insurance coverage need. It’s pretty common to assume that only working parents need life insurance. After all, a life insurance death benefit is meant to cover costs that normally would have been paid for by a wage earner’s salary. However, it’s also important to consider the dollar value of services that might have to be outsourced if a stay-at-home parent were no longer in the picture. According to the Care Index, which tracks child-rearing expenses across the U.S., the average cost of in-center childcare is just over $9,500 per year. And for at-home care? It skyrockets to more than $28,000 per year. These services — along with babysitting, cooking, housekeeping, shuttling kids around, running errands, etc. — might have to be hired out if a stay-at-home parent were to pass away. That’s where life insurance would kick in. Nope, it’s not just parents who need life insurance — but coverage often gets overlooked for couples who don’t have direct dependents. Here’s the thing: Even if you and your partner don’t have children, you likely have shared financial obligations. Did the two of you go in together on a mortgage? Are you paying off a new car? Did one of you support the other in taking out a business loan to pursue their dream career? If one spouse passed away, the other would end up shouldering weighty debts like these. Life insurance can provide substantial relief in such situations. It acts as a backup plan for all of your biggest money concerns — kids or otherwise. Life insurance payments go to the policyholder’s “beneficiaries,” which are typically understood to be the spouse and children. But you should be thinking about your own parents as beneficiaries, too. According to the U.S. Department of Health and Human Services, 52% of people age 65 and older will end up needing long-term care at some point. And that care doesn’t come cheap. The average cost of assisted living or a room at a nursing home ranges anywhere from $3,600 to $7,700 per month. Children often end up assisting their parents with those expenses, or even footing the bill themselves. A life insurance policy can help ease the financial strain of paying (or helping pay for) long-term care. You policy ensures that all of your loved ones, including your parents, would receive the care and financial support they need, no matter what happens. We mentioned co-signers with regard to married couples, but it applies to single people, too. If you’ve ever had someone co-sign a loan with you (be it a student loan, auto loan, mortgage, etc.) or open a joint account (like a credit card), they could be liable for any unpaid balance on those contracts. A life insurance policy can protect your parents, partner, or other financial supporter from having to pay debts that aren’t covered by your savings or assets. If you own a small business, odds are you took out substantial loans to kickstart or grow your brainchild. You might think that your business itself would provide collateral to pay off those debts if you were to pass away — but unfortunately, that’s often not the case. Life insurance can help cover outstanding business loans and other expenses required to get a company’s affairs in order if its owner passes away. This protects their family from having to dig into savings or liquidate other assets to get the funds they need. This one might be self-explanatory, but: If no one else depends on your income, if you don’t share finances with a partner, and if you don’t have co-signed student loans, auto loans, or credit cards, you probably have little need for life insurance right now. That said, a minimal need for life insurance doesn’t mean you shouldn’t at least start thinking about it. Odds are you’ll want coverage eventually — whether because you start a family, buy a house, or take out a small-business loan — and life insurance only gets more expensive as you get older. Try requesting a few term life insurance quotes online to see how rates would shake out. You may find that you’ll save money in the long run by buying earlier. As long as you have enough money in savings to cover final expenses and you don’t have substantial estate management considerations, you might not need life insurance to set your affairs in order after you pass away. Keep in mind, though, that life insurance can offer protection outside of the death benefit that you might miss out on by foregoing coverage. For example, add-ons like an accelerated death benefit or long-term care rider offer up some of the policy’s value during life to cover costs associated with a long-term illness. These can save the policyholder and their family from paying extensive medical and assisted living bills out of pocket. Make sure you’re considering life insurance in all of its different lights before deciding to discontinue your policy or pass on renewal. You might think that the more wealth one has, the lower their need for life insurance. And that’s often the case. If you’re retired, debt-free, and have a well-stocked savings account, you might not need to worry about buying life insurance right now. There’s a good chance your wealth would cover all necessary end-of-life expenses without the aid of a death benefit payment. However, there’s one notable exception to that rule. People who plan to hand down a large estate — and we’re talking really large, as in more than $11 million dollars — should plan for their heirs to have to pay estate taxes. Those folks might consider life insurance as a way to cover estate taxes without their beneficiaries having to dip into their inheritance. Wondering If You Can Afford Life Insurance? If you fit into one of the “probably needs life insurance” groups listed above, you might be wondering whether a new insurance policy would fit into your budget. The good news? The idea that life insurance is expensive is a pretty common misconception; it’s probably cheaper than you think. 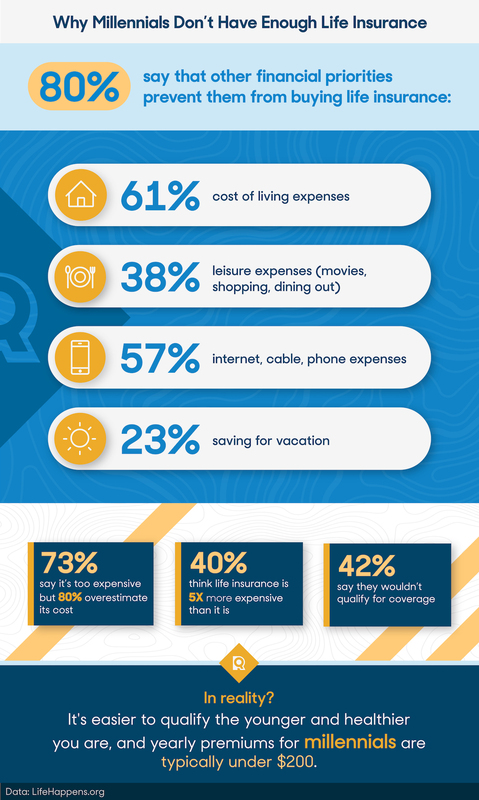 Here’s the kicker: A high percentage of millennials say they prioritize utilities like cable and phone bills and activities like dining out or shopping ahead of life insurance. But a basic term life policy is actually cheaper on a monthly basis than many of these other expenses. For a young, healthy individual (think 20s to early 30s), term life insurance often costs between $10 and $30 per month. That means for the same price as a nice meal out (or a single month of TV streaming), you could secure a few hundred thousand dollars’ worth of financial protection for your loved ones. 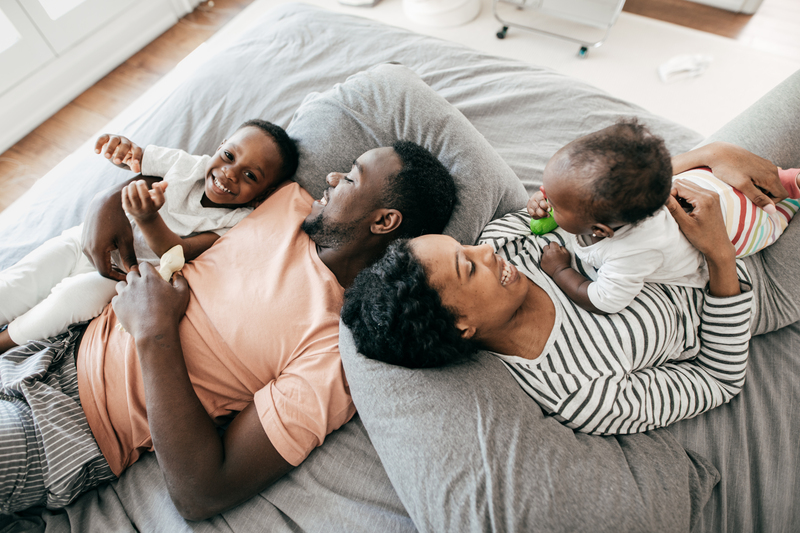 We won’t tell you how to manage your budget, but it’s worth thinking about it in these terms before you decide whether or not to make life insurance a priority. If you’re convinced that you need life insurance but not sure where to begin looking, we have some resources to help you out. Check out our FAQs on term life insurance and whole life insurance for more information about the two most popular types, or see this article on term versus whole life insurance for a head-to-head comparison.